The Inspector-General of Taxation’s 2017-18 Corporate Plan outlines how the Office of the Inspector-General of Taxation (IGT) intends to deliver against its purpose over the upcoming four years. This document, which covers the 2017­-18 to 2020-21 reporting periods, is required under paragraph 35(1)(b) of the Public Governance, Performance and Accountability Act 2013 (PGPA Act). It sets out our purpose, operating environment, planned performance and capability as well as risk oversight and management. conducting reviews and making recommendations for improvement to the Government, the Australian Taxation Office (ATO) and the Tax Practitioners Board (TPB). The environment in which we operate continues to evolve. Our key functions are investigating individual complaints and conducting broader reviews into tax administration issues. These functions provide us with the opportunity to interact with a broad range of stakeholders to gain real time insights into emerging issues, identify areas for potential improvement and offer independent assurance about the tax system where appropriate. This is particularly important in light of the complexity of tax laws and its administration. Our operating environment is influenced by our relationships with stakeholders and their expectations regarding the delivery of our services. international organisations, including overseas revenue agencies and counterparts. Critical to our role is our ability to anticipate and respond to changes, including increasing community expectations for more effective complaints handling and associated improvements to the tax system. Adapting to this changing environment remains an ongoing challenge for the office. Over the next four years our focus will be on improving and establishing strategies to fulfil and manage the above expectations. We anticipate an increase in the number and complexity of complaints as awareness of our role and satisfaction with our service becomes more widely known. We will also continue to maintain a programme of reviews, which is increasingly guided by real-time insight on themes and issues emerging from our complaints handling work. Similar to previous work programmes, the IGT will continue to consult with the broader community, including taxpayers, tax practitioners and their representative bodies to identify and prioritise the tax administration issues of most concern. We seek to fulfil our purpose through a range of deliverables. These are set out in the tables below, along with how they will be measured. 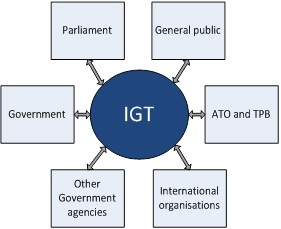 The performance framework is intended to inform Parliament as well as ensure that IGT staff are aware of the impact of their work and how the deliverables achieve the fundamental goals of the IGT. Actively investigate complaints in a fair, independent and timely manner. Provide understandable reasons for our decisions. Maintain cooperative relationships with the ATO and TPB. Identify and share improvement opportunities, internally and also with the ATO and TPB, to ensure effective delivery. Provide training and development to staff in order to maintain a tax specialist complaints handling team. Analyse data and feedback obtained from complaints together with consultation with stakeholders to identify broader tax administration issues. Allocate resources appropriately to priority areas. Being responsive to the community, including the Government, the ATO and the TPB in making effective recommendations for improving tax administration. Allocating resources to conduct reviews appropriately. These measures will be assessed in the annual performance statement. Our people are our success and are highly valued for their work. Our strategy is centred on employing and retaining experienced tax specialists with the ability to provide a professional, effective and independent service to the community. We are also committed to workplace diversity, for example as evidenced in our Gender Equality Action Plan 2017-19. We seek to provide a challenging and supportive environment in which our staff are inspired to provide the best outcomes. We will continue to enhance our capability through multi-skilling, training and development opportunities that are responsive to our requirements and the evolving needs of the broader community. Feedback received from external stakeholders and from our staff is also used to improve our service delivery. Over the next four years, we will continue to enhance our business capability and use technology to innovate and improve the way we manage and deliver our services. Our strategies include information management and technological solutions to manage our complaints handling function and identifying the resources required to support our existing and future organisational needs. 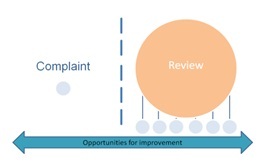 A focus for the future is to improve our systems to efficiently identify emerging issues that arise from complaints, from which we can allocate resources to conduct broader reviews. 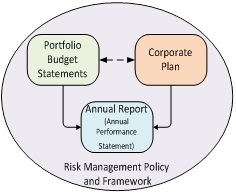 Our corporate plan is directly linked to the Portfolio Budget Statement, the Risk Management Policy and Framework and is reported in the annual report as part of our annual performance statement. Risk management is an integral part of the IGT’s business planning and governance processes. Our processes also need to reflect the size and specialist function of the office. We have established and maintained appropriate systems of risk oversight, management and internal controls in accordance with section 16 of the PGPA Act and the Commonwealth Risk Management Policy. Risks are identified, regularly monitored and reported through our Risk Management Policy and Framework, including use of our Risk Register. Risks identified through these processes are considered and discussed by the IGT’s management team and reported to the Audit and Risk Committee. This Committee is established and structured in accordance with section 45 of the PGPA Act and the PGPA Rules. It meets on a periodic basis to consider audit and risk matters including fraud control. a forward plan of review activities. managing our budgets and allocating resources appropriately to ensure efficient delivery of our services. Effective management of these risks requires a holistic approach and therefore responsibility for managing these risks rests with all our staff. Details of our programme expenses can be found in the 2017-18 Portfolio Budget Statements.